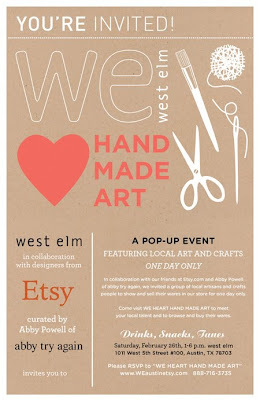 I just found out about a little event crafty and mid-century design lovers might be interested in. West Elm, Etsy and abby try again are putting on We Heart Handmade Art, a one-day, pop-up event. And it looks like the lovely ladies of Spruce, a.k.a. the Spucettes, are going to be there as well.